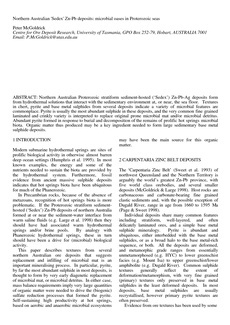 Northern Australian Proterozoic stratiform sediment-hosted (‘Sedex’) Zn-Pb-Ag deposits form from hydrothermal solutions that interact with the sedimentary environment at, or near, the sea floor. Textures in chert, pyrite and base metal sulphides from several deposits indicate a variety of microbial features are commonplace. Pyrite is usually the most abundant sulphide in these deposits, and the very common fine grained laminated and crinkly variety is interpreted to replace original prone microbial mat and/or microbial detritus. Abundant pyrite formed in response to burial and decomposition of the remains of prolific hot springs microbial biota. Organic matter thus produced may be a key ingredient needed to form large sedimentary base metal sulphide deposits.